On Friday I ventured to my first estate sale. I think I've always waited for someone who was comfortable in the realm of buying other people's stuff to invite me along with them. The interpersonal aspect of it gives me knots in the pit of my stomach. "Hi stranger, how much do you want for this here posession?" I guess because I'm sentimental I assume other people have sentimental value attached to their belongings as well. This was a bad first estate sale. But I didn't know that in advance. I just saw this gorgeous quarter-sawn oak dresser listed online for pennies, and since our gentleman's clothes are still living in boxes on the floor of his closet, I had to give it a try. I begged for our favorite neighbor to listen for my kids on the monitor and took off insanely early. I got there 10 minutes early, but I may as well have been an hour late. There were people crawling everywhere. It was impossible to tell who was running the show. I finally spotted someone asking a lady a question and approached her to inquire about the lovely dresser. It was still in the house, in the basement. For a tiny moment my heart leapt. But then a tall, middle aged, confident lady behind me piped up with, "Oh, I was looking for it too!". I was sunk. I could tell she was a pro. But she didn't want to exert all of her powers of thrifting over such an obvious novice as I, so she kept giving me opportunities to bow out gracefully. I tried to be stubborn. I certainly needed the dresser more than she did, but she kept laying out, her "craftsman home" that she was trying to fill with "period pieces" as though it was the reason the dresser already rightfully belonged to her. I had more money on me than her, but she waved her magic cell-wand and her daughter showed up with several hundred dollar bills and I had no reason to hope. In the end I lost the dresser in a game of "choose a number between 1 and 10", the confident lady let her granddaughter pick the number. 2, "but I always choose 3, it's my lucky number." Which, having said that I could choose neither 2 nor 3, because hadn't she just essentially chosen them both? I went with 5, thinking the odds were decent for me, but the number had been 3. Of course. So I helped load the dresser into the confident lady's truck with a leaden heart. What made this experience all the more painful for me was that the estate sale was clearing out the possessions of a lady who was very much alive. and present. and sobbing. She was, of necessity, moving in with a daughter, and the stuff had to go. But oh, how she sobbed on the porch. And so, after losing and feeling that I'd begged a babysitter, driven miles, and forfeited my dignity in vain, I found it difficult to stay and peruse anything else at the sale. But leaving straight away tasted too much like being a sore loser to me. Even if I am a sore loser, I'm still opposed to acting like one. So I bought a small bookshelf and a ladder. There was another dresser in the house, I probably ought to have bought it and called it good. 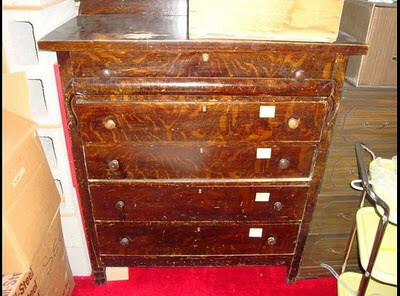 But the other dresser was so very very ordinary compared to the magnificent images my mind had created of restoring the remarkable one. I didn't have the spirit to draw that much attention to myself. I couldn't move a dresser without help. I needed to hurry home and nurse my wounded pride and anxiety. Just as soon as I'd made an acceptable show of good sportsmanship. The problem is, that the whole experience has festered for me all weekend. I'm so frustrated at the condescension of the confident lady. I'm exasperated with her lucky guess. I'm haunted by the woman sobbing on the porch. I wish I could just make it all go away. But, unable to do that, I can at least vow to never go to an estate sale alone again. So unless you invite me, you will not run into me there.